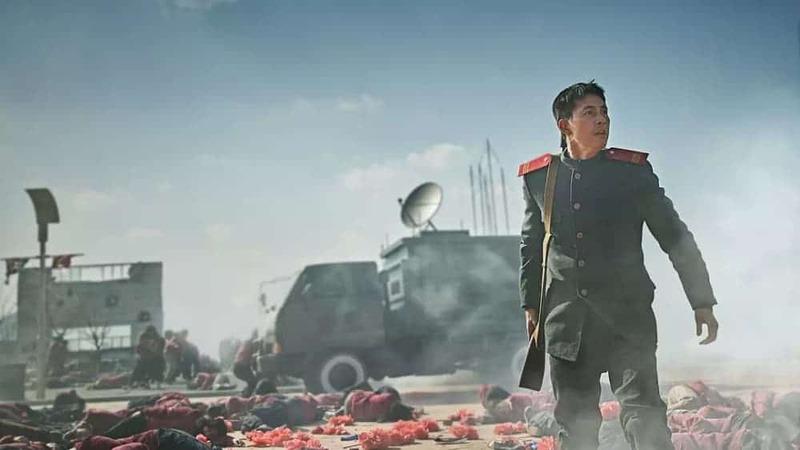 Based on Yang Woo-suk’s 2011 homonymous webtoon, “Steel Rain” attempts to deal with the scenario of a North Korean coup d’état, through a Hollywood blockbuster approach, for the most part. Eom Cheol-woo, a North Korean agent, is tasked with an assassination mission, only to become witness to a terrorist attack which is actually a coup d’état, involving an US army helicopter. After the disaster that follows, Eom ends up in the South, along with his injured No. 1. Through a number of adventures including a young obstetrician and a plastic surgeon, Eom ends up with Kwak Cheol-woo, senior presidential secretary for foreign affairs and national security for the S. Korean government, who also happens to be the ex-husband of the aforementioned plastic surgeon. The two of them try to prevent the breakout of a nuclear war on the Korean Peninsula. The basic idea of the film, of the cooperation of North and South individuals to face a greater evil, although much visited in the Korean industry, is quite good, particularly regarding the political aspect and the way the idea of a coup d’état in the North is presented. However, as the Hollywood blockbuster aesthetics take over, one cannot but notice how far-fetched the story goes, particularly regarding the various coincidences that occur, and the depiction of the North, which borders on South jingoism, through a number of quite pointy comparisons. Lastly, some elements of melodrama could not be missing from here either, as is the case with almost all Korean films that aim at commercial success. On the other hand, the movie benefits the most from the many and quite impressive action scenes that highlight the budget of the production, along with Lee Gang-hee’s excellent editing, and Lee Hyung-deok’s cinematography. The SFX are top notch, particularly in the scenes that involve nuclear weapons, while the action choreography is one of the film’s best assets, in similar fashion with the “Bourne” movies. Overall, “Steel Rain” is an enjoyable production that will definitely appeal to fans of Hollywood action blockbusters. However, most of the movie’s elements points towards the flick, in a production that will be forgotten as easily as it is watched.